Traffic near Albany last summer. Volunteers in the road user fee program will be charged more starting Jan. 1. 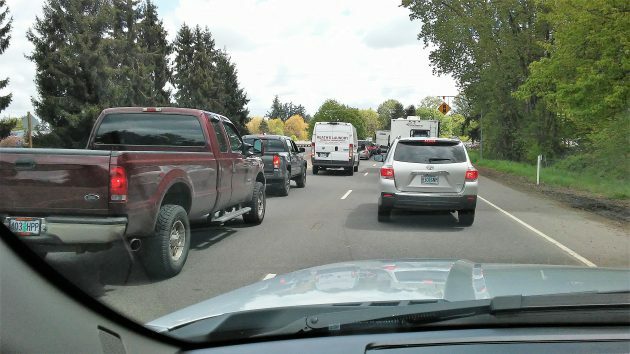 Oregon’s low-key experiment with charging road users by the mile continues, and on Monday the fee goes up in order to keep up with the jump in the state gas tax. OReGO, as the program is called, allows volunteers to sign up their vehicles for this experimental fee. A gizmo in their cars reports how many miles they drive, and an account manager keeps track of how much fuel they are presumed to have burned. They get credit for the fuel tax they paid, and they are charged the “road user fee,” which until now has been 1.5 cents a mile. On Jan.1, when the gas tax jumps 4 cents to 34 cents a gallon, the road user fee inches up to 1.7 cents per mile. At 20 mpg, a vehicle owner pays about the same in gas tax as the road fee. And since one offsets the other, it’s a wash.
I’ve been a volunteer in the program since it started in July 2015. Currently my fuel credit is a tiny bit higher than my road user charge. So for a 6-mile drive, the state owes me $0.0015. That’s one-and-a-half thousandth of a dollar. Big deal, right? My current balance on the truck I’ve driven since May 2016 is $4.63. The state won’t pay until the amount hits $20. At the current rate that may be in three or four years. The idea behind all this is that the gas tax can’t keep up with the need for highway revenue as vehicles get ever more efficient and some don’t use motor fuel at all. But collecting the road fee is not cheap since it involves contracting with private companies to provide the technology. ODOT makes no effort to disclose the cost. A report on the program last April completely glosses it over, and the ODOT budget makes it impossible to find (at least for me). But it has to run into the millions per biennium, considering the contracts with three vendors and the technology, personnel and bookkeeping involved. In addition, the federal government has given millions of dollars in grants to Oregon, California, Washington and other states to explore expanding this system across state lines. So far the idea has not caught on among the public. The legislature authorized up to 5,000 vehicles to be signed up for OReGO, but the program reports that only 669 were active at the end of last year. And as of last June, the number was 745. The longer I’m in this program, the more I think there has to be a simpler way. Such as: Keep collecting the gas tax for roads and raise it as necessary, and collect a proportionate mandatory annual road user fee on all vehicles that don’t use motor fuel, or use very little. That should keep things fair, and it avoids all the technological issues and administrative costs. 1 – Road wear and the need for maintenance (a significant expense). Tax only by the mile ignores the large effect of vehicle weight and whether or not studded tires are used. 2 – Congestion, its resulting expense, misery, and pollution. The perceived need to build new capacity at gargantuan expense. 3 – Consumption of finite natural resources and the ever-increasing cost to extract them. Regional environmental costs. Add in global warming (or this year’s name for it;) if you want. Gas tax directly attacks this. Electric cars are more complicated; some kilowatt-hours are much more troublesome than others. 1 – Gas tax just as now. Add a special tax on studded tires. 2 – Tax on electric charging. Easy fix for commercial charging stations. More problematic at home: needs new technology and cooperation with car makers – separate smart meters with rate depending on time and availability (much like congestion pricing) – fines for circumventing the separate meter. Short of something like this I don’t have a good solution for electric cars. Maybe a weight-adjusted mileage system is needed. 3 – At least in urban areas, the biggest part of the mix should be congestion pricing because the biggest cost is building new lanes and roads needed mostly because of congestion. A huge benefit: travel time and air quality improve as soon as drivers adjust their times and habits to meet their own needs and budgets, no need to wait decades for new construction. Discounts for multiple occupancy encourage car-pooling. The concern about being tracked by government is easily solved by anonymous re-loadable transponders bought with cash. By the way, I’m very opposed to the “annual road user fee” because it does nothing to discourage traffic, congestion, and waste. For the same reason, I want to see the elimination or reduction of all fixed costs of car ownership. But road consumers will probably never trust that an overreaching government can adequately protect personal privacy, even though the Oregon program seems to have good safeguards in place. The irony is that taxpayers will have no choice but to continue with the system of road socialism that is currently imposed. Yes, The overreaching government is about as good at protecting digital information as are the overreaching for-profit companies. The only difference is, I can vote against overreaching government officials to be rid of them. The same cannot be said of overreaching corporate interests. I’ll take my chances on a system that at least pretends to exist for the good of the people. It is abundantly clear the private sector cares ONLY for profit. HowlingC and Hartman bring cogent points to the discussion. Accommodating urban congestion via construction seems to increase traffic while maintaining congestion. When the problematic behavior becomes expensive enough, folks will look for a cheaper behavior. The State of Oregon has a pretty dismal record of managing anything that has to do with electronic data management, actually, anything to do with managing money or technology. I would rather pay gas tax at the pump than allow the state to bill me.